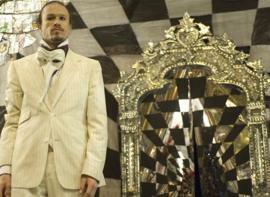 At the time of its release The Imaginarium of Doctor Parnassus was marketed as Heath Ledger’s last movie and a return to form for director Terry Gilliam (Brazil, Time Bandits). It is at least one of these things. The Dark Knight actor did indeed tragically die of an accident overdose whilst working on it; whether it is a return to form for director Gilliam is however questionable. We are talking of the man behind Brazil here . . .
Fortunately for the film’s investors, the actor’s untimely demise didn’t result in the movie being scrapped like director Gilliam’s ill-fated Don Quixote project. Instead the story was rewritten and the movie re-edited so that Ledger’s character could be also be portrayed by Johnny Depp, Jude Law and Colin Farrell. It was an inspired move and having one character being portrayed by four actors wouldn’t have worked in any other director’s movie. Here it fits in with the general weirdness of everything. Unfortunately much of the film’s problems also stems from this rewrite: Ledger’s character is supposed to be ambiguous, but things just come across as muddled instead. Is he an anti-hero striving for redemption like in Gilliam’s The Fisher King? Or is he simply the bad guy? Logically the narrative focus should be on Christopher Plummer’s character but Heath Ledger’s and the side-characters’ presence distracts from this. The end result is an uneven and erratic film that is difficult to emotionally connect with. Still, the film has some typical Gilliam eye-popping visuals and is largely entertaining. However as with many of the director’s more recent output one cannot escape the feeling that it could have been so much better.